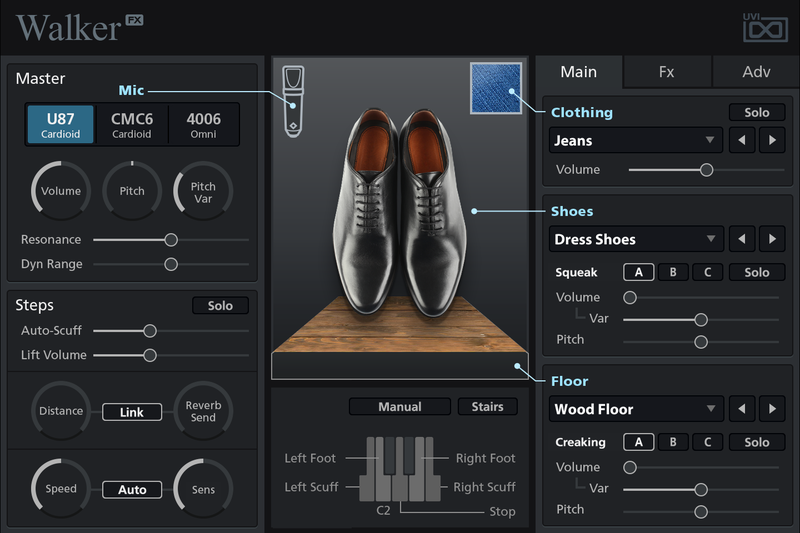 Walker is a comprehensive, flexible and easy to use sound design tool that delivers everything you need to create realistic footstep and movement sounds. 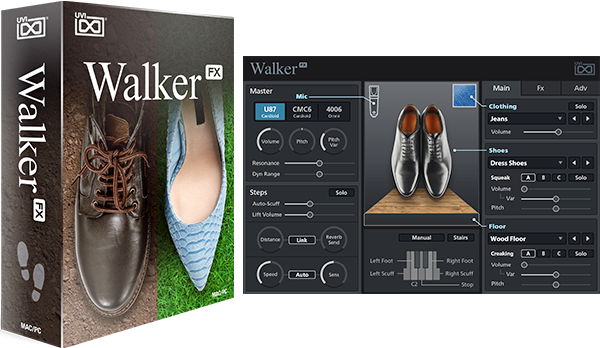 Built on a library of over 25,000 samples, Walker lets you choose any combination of 3 different mic pairs (placed near and far), 6 types of shoes, 14 ground surfaces with ground effects and 8 types of clothing. 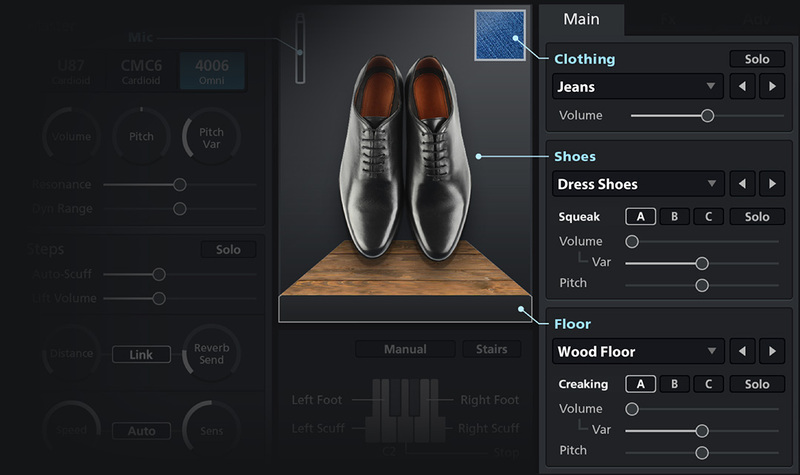 Perform steps in auto or manual modes with independent control over toe, heel and scuff timing to create perfect sync with your source, and adjust the volume of clothing, shoes, scuffing, floor and ground effects like creaking wood, dirt, leaves and branches, water and more to get the exact sound needed. Deep, flexible and well organized, Walker is an indispensable tool for post facilities and sound designers. Walker was designed from end-to-end to provide an exacting quality for the demands of professional use. A massive library of over 25,000 samples was meticulously recorded at the prestigious Technicolor Sound Stage in Paris, France and edited for precise and reliable playback. Each sound was recorded with 3 matched mic pairs placed near and far, exposed and selectable within the UI, including Schoeps CMC6 (small-diaphragm cardioid), Neumann U87 (large-diaphragm cardioid) and DPA 4006 (omni-directional). Select which mic pair to monitor, adjust the volume, pitch and pitch variance (to create natural variation), resonance and dynamic range. 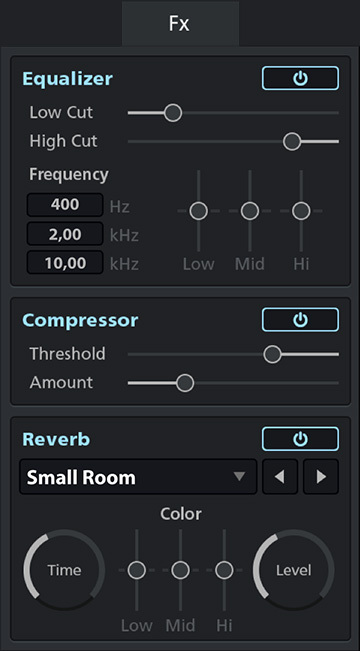 Fade between the near and far positioned mics using the Distance knob, add reverb, and enable Link to dynamically increase the reverb amount with distance. Set the step speed and sensitivity independently or automatically, control the volume of shoe lift and utilize the Auto-Scuff slider to increase the frequency of scuffing during steps. Switch between Automatic and Manual modes for simple one-tap step cycles or manual control over each component of the step sound including; toe, heel and scuff for both the left and right foot independently. A Stair switch disables the heel sound component to simulate the sound of stepping up or down a flight of stairs. The sound of steps made by the shoes. Select from 6 different shoe types including; men's dress shoes, heels, work boots, trainers, boots and bare feet. Choose shoe squeak variations, adjust step volume, volume variation and pitch. The sound of the ground surface made during steps. Select from 14 different surfaces including; wood floor, linoleum, tile, concrete, carpet, wood, dirt, gravel, grass, forest, metal, mud, sand and snow. Choose variable ground effects such as wood floor creaks, crushing vegetation and water puddles, adjust volume, volume variation and pitch. The sounds of legs brushing together and fabric movement during steps. Select from 8 material options including jeans, cotton, leather, leather with metal, polyester, raincoat, synthetic and tweed, and adjust volume. 3 effects include a variable 3-band EQ with high and low cut, compressor and IR-based reverb with control over delay time, color and mix. 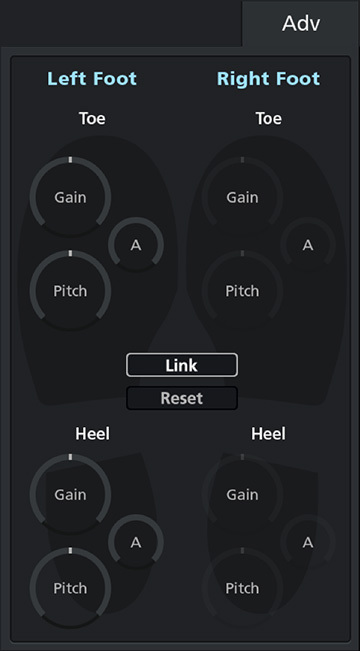 Independent control over left and right foot toe and heel sounds, with linked or discrete gain and pitch settings. 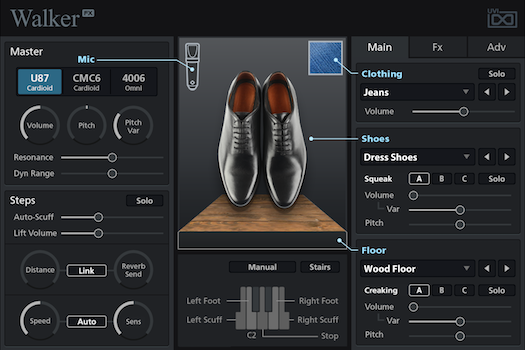 Walker includes a large selection of ready-made presets to help speed-up your workflow. 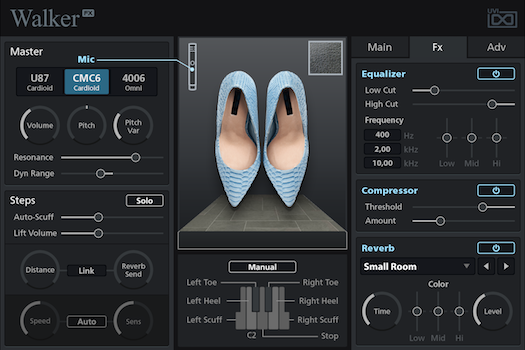 Choose from templates such as Alley - Trainers, Church - High Heels, Creaking Floor - Bare Feet, Upstairs Neighbors - Dress Shoes etc., then once selected, settings can be tuned as needed and can be saved as either discrete presets or with your DAW session. 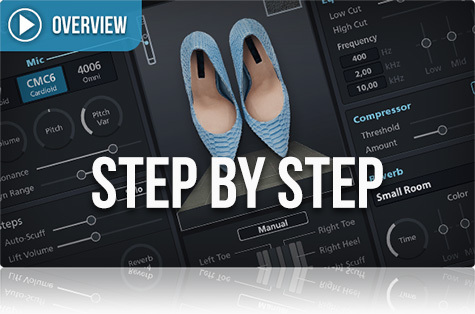 A comprehensive and fully-customizable software solution for creating realistic cinema-quality footsteps and feet foley, Walker provides complete sound customization, smart-automation and exceptional sound quality in a convenient and easy-to-use package.